J.K rowling was fired from her old job as a for daydreaming too much. after that, she wrote the Harry Potter books. 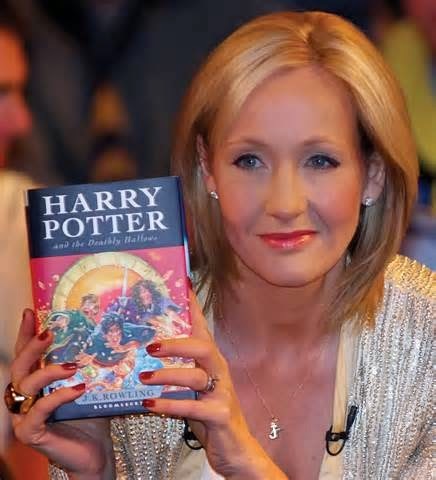 Joanne Kathleen Rowling was born July 31, 1965 in Yate, Gloucestershire, England. It is interesting to note that Ms. Rowling claims that she has actually been writing since she was 5 or 6 years old. Her first story, called Rabbit, was filled with interesting characters, such as a large bee called Miss Bee. Ms. Rowling, along with her parents and sister, moved twice while J K was growing up. While at one of their homes, close to Bristol and in Winterbourne, she had friends next door whose last name was Potter. J K never forgot the children, or the last name, which she liked very much. Jo left Chepstow for Exeter University, where she earned a French and Classics degree, and where her course included one year in Paris. As a postgraduate she moved to London to work at Amnesty International, doing research into human rights abuses in Francophone Africa. She started writing the Harry Potter series during a Manchester to London King’s Cross train journey, and during the next five years, outlined the plots for each book and began writing the first novel. Jo then moved to northern Portugal, where she taught English as a foreign language. She married in October 1992 and gave birth to her daughter Jessica in 1993. When her marriage ended, she returned to the UK to live in Edinburgh, where Harry Potter & the Philosopher’s Stone was eventually completed, and in 1996 she received an offer of publication. The following summer the world was introduced to Harry Potter. Ms. Rowling met and married a journalist in Portugal (he was Portuguese), and her daughter Jessica was born in 1993. Shortly after the birth of her daughter, the marriage ended in divorce and Ms. Rowling, along with her infant daughter, moved to Edinburgh, Scotland so that J K could be near her younger sister, Di. It was during this time that Ms. Rowling became determined to not only finish her Harry Potter "˜wizard' novel, but to get it published. Often she would write in restaurants, where she and her daughter could stay warm while she wrote. Ms. Rowling requested a grant from the Scottish Arts Council, which she eventually received, in order to complete her book. When it was completed and after several rejections, Ms. Rowling sold the novel, Harry Potter and The Philosopher's Stone, to Bloomsbury in the UK for the equivalent of about $4,000. Since having been launched into the literary stratosphere as a result of the Harry Potter series (Forbes named Rowling the first person to become a billionaire by writing books), Rowling has been the recipient of numerous honors, honorary degrees, and awards. She has been an avid supporter of various charities and causes, most notably poverty relief and multiple schlerosis, from which her mother died in 1990. Since her second marriage to Dr. Neil Michael Murray in 2001, Rowling has had two more children - a son, David, and daughter, Mackenzie. Marble Caves, Chile Chico, Chile!